The Leyland cypress is an evergreen tree commonly planted as a hedge or wind barrier in home landscapes. The tree is easy to grow and tolerates poor soil quality, making it susceptible to disease problems. Taking precautions to prevent disease in Leyland cypress is a good management practice that will increase the life span of the trees. 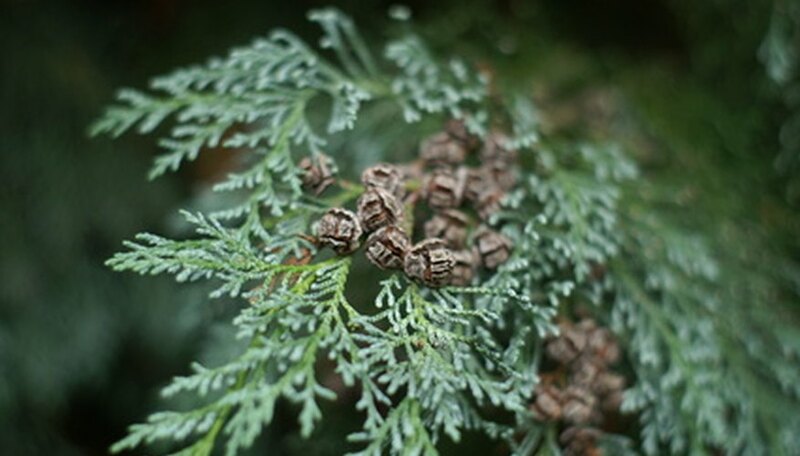 Leyland cypress trees are susceptible to the fungal diseases canker and root rot. Canker is caused by the fungus types Seiridium and Botryosphaeria which infect the tree at the base of the trunk or branch intersections. Root rot is caused by the fungus types Phytophthora cinnamomi and Heterobasidion annosum and infects the trees root ball. These fungus types are naturally occurring in the soil. Leyland cypress trees infected with canker have a large, wartlike growth on the base of the trunk or branches. The cankers are purple or dark brown in color with black spores on the surface. Severe cases will ooze a liquid resin out of the canker. A canker infection may cause the tree foliage to turn yellow in color. Root rot fungal infections show symptoms of yellow foliage and drooping branches. Some cases of root rot will cause the entire tree to turn red-brown in color. Trees with a severe infection may fall over with or without the presence of brown- and white-colored fungus around the base of the tree at ground level. Canker and root rot fungal infections in the Leyland cypress tree are caused when there is an increase in soil moisture which creates the right environment for fungus production. Canker fungus enters through wounds on the tree. The spores are spread when water splashes on the spores and transports them to other trees or through open wounds made with contaminated pruning equipment. Root rot infections are caused when there is an increase in soil moisture which causes the fungus to produce and become mobile. The fungus enters the tree through the root hairs and causes the roots to soften and fall apart. There are no chemical treatments for canker and root rot infections. Trees infected with trunk canker or root rot must be removed and destroyed, since the trees will eventually die off. The stump and root ball should be removed from the ground and a fungicide worked into the soil. Branches with canker infections can be pruned from the tree at least 1 inch below the infection point. Disinfect the pruning tools with a solution that contains 10 percent bleach after each cut to prevent spreading the fungus. Fungal infections in Leyland cypress trees are prevented by amending the planting area with organic compost to increase the water-draining ability. Do not plant trees in low areas where water pools for long periods of time. Disinfect pruning tools prior to using them and after each cut to prevent accidental contamination. Prune trees during the dormant season when infections are less likely to occur.